Epson EH-TW9000W review | What Hi-Fi? The Epson EH-TW9000W’s big USP may be wireless HDMI connection, but that’s not the reason we like it so much. The Epson EH-TW9000W’s big USP may be wireless HDMI connection, but that’s not the reason we like it so much. This is a well-conceived product from the reassuring quality of its build to the ease of set-up. 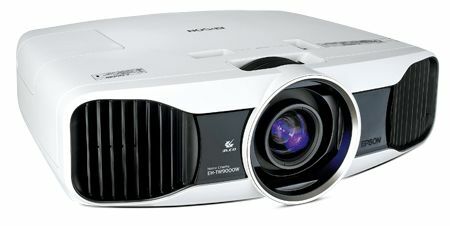 Epson shows its experience in designing projectors by including thumbwheel adjustments for horizontal and vertical lens shift, sensibly laid out menus and a nice-to-use back-lit remote handset. As is usual for projectors at this price you can play around with various motion, contrast, colour and noise modes to your heart’s content. With motion and contrast we liked the low settings. We left the colour and noise options off. Once you work through the choices to your tastes, you should end up with a very fine picture. Using the (wired) HDMI input the picture is nice and crisp. Play something like The Imaginarium of Doctor Parnassus and the wealth of colours are a pleasure to watch. The Epson has a secure way with motion and does a decent job combining bright and dark elements in a single frame. Compared with the likes of the Award-winning Panasonic PT-AT5000E deep blacks are a little less emphatic and there’s a touch less insight. But, by most standards the picture performance is good. Give 3D a try –the Epson comes with two pairs of glasses in the box (each extra pair will cost around £70) – and the 9000W delvers a pretty convincing image. There are some minor issues with image stability with fast motion, and a tendency to make 3D look more like layered 2D on occasion. Most rivals we’ve tested share similar traits. The performance with DVD is consistent with that experienced with Blu-ray discs. The picture is nicely detailed with a well-judged way with colours. There are the usual noise and motion shortcomings innate in the format, but on the whole there’s much to like here. really easy. Just plug the HDMI cable into the supplied mains-powered transmitter and it syncs with the projector in a few seconds. The transmission works with 1080 and can also cope with 3D. is a slight drop-off in outright clarity and colour rendition. There’s a hint more picture noise and greater motion instability with fast motion too. In each case the shortcomings are slight, but they’re enough for us to recommend the wired link if picture quality is paramount. That said, if you really need wireless connectivity the Epson is easily the best we’ve come across. This is yet another fine Epson projector – it’s capable and well-thought out. If its wireless configuration appeals, jump right in. This is a well-conceived product from the reassuring quality of its build to the ease of set-up. As is usual for projectors at this price you can play around with various motion, contrast, colour and noise modes to your heart’s content. With motion and contrast we liked the low settings. We left the colour and noise options off. Once you work through the choices to your tastes, you should end up with a very fine picture. Using the (wired) HDMI input the picture is nice and crisp. Play something like The Imaginarium of Doctor Parnassus and the wealth of colours are a pleasure to watch. The Epson has a secure way with motion and does a decent job combining bright and dark elements in a single frame. Compared with the likes of the Award-winning Panasonic PT-AT5000E deep blacks are a little less emphatic and there’s a touch less insight. But, by most standards the picture performance is good. Give 3D a try –the Epson comes with two pairs of glasses in the box (each extra pair will cost around £70) – and the 9000W delvers a pretty convincing image. There are some minor issues with image stability with fast motion, and a tendency to make 3D look more like layered 2D on occasion. Most rivals we’ve tested share similar traits. The performance with DVD is consistent with that experienced with Blu-ray discs. The picture is nicely detailed with a well-judged way with colours. There are the usual noise and motion shortcomings innate in the format, but on the whole there’s much to like here. Switching to wireless operation is really easy. Just plug the HDMI cable into the supplied mains-powered transmitter and it syncs with the projector in a few seconds. The transmission works with 1080p and can also cope with 3D. Using the wireless connection the picture remains good, although there is a slight drop-off in outright clarity and colour rendition. There’s a hint more picture noise and greater motion instability with fast motion too. In each case the shortcomings are slight, but they’re enough for us to recommend the wired link if picture quality is paramount. That said, if you really need wireless connectivity the Epson is easily the best we’ve come across.